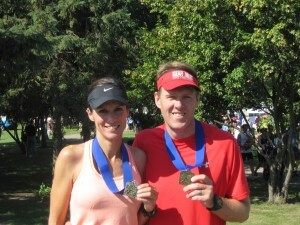 Thanks to a typo in my training schedule, I had the opportunity to sneak in a half marathon on Saturday. 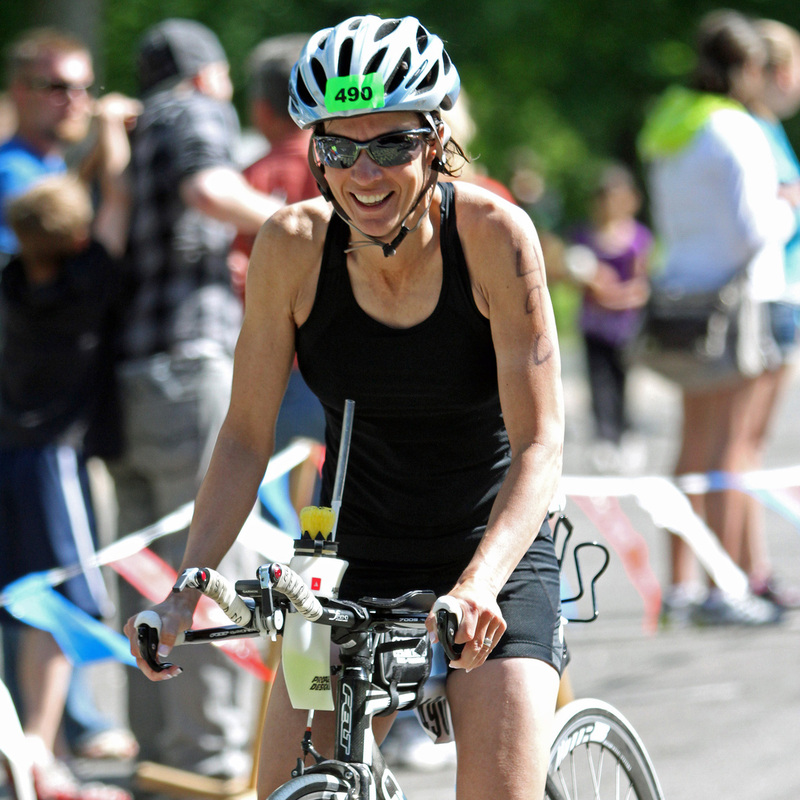 My training plan has a summary schedule with big dates such as the start of training, the beginning dates for each phase, and then dates for practice triathlons. I scheduled my races based on that summary schedule including an Olympic distance tri and a half iron distance tri. That summary schedule put my Oly triathlon back at the end of June. 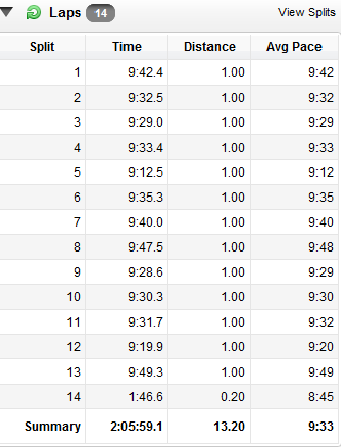 The actual day to day training schedule, however, had a slight taper and Olympic distance race this past week. Whoops! I already paid for the other race and couldn’t find a good one to replace it with on the right weekend, so I just left my triathlons as I had originally planned. Since the detail schedule had a mini-taper built in, I thought it would a great opportunity to sneak in a half marathon. I’ve been itching to do a road race this season so this was the perfect chance. 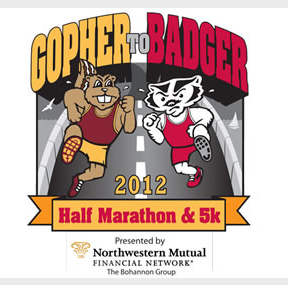 Mike and I did the Gopher to Badger in 2008 when I was training for the Twin Cities Marathon. It was only my second half marathon and it was a hot and humid day. I remember crossing the finish line thinking that I would never do that race again. Funny that 4 years later I was actually excited to see that it happened to fall on the weekend that I was looking for a half marathon. I thought it would be fun to see how my perspective changed after running 13 half marathons and hopefully with some better weather. The first time I ran this race, I was running it for time. I remember crossing the finish line and being physically ill. I was supposed to tack on another mile or two for my marathon training, but I was spent. 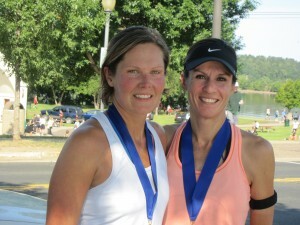 This time, I wanted to run with a friend and keep it at a comfortable pace. If I’m able to come of the bike at Ironman Florida in condition to run, then I’m going to need to keep my heart rate under control so this would be a good time to practice in a race setting. We both tend to run around a 9:40-9:50/mile pace when we do our regular runs, so we targeted 9:40/mile and decided to see how that went for a while. Unlike 2008, Saturday was a beautiful, cool day with just a slight breeze. It couldn’t have been more perfect running weather. We slipped off our throw away shirts right before the race started and I was comfortable the whole race. Now it’s back to ironman training. I’m finishing up the build phase and am going to be heading into peak phase next week. That is training code for “the workouts are about to get insanely long”. 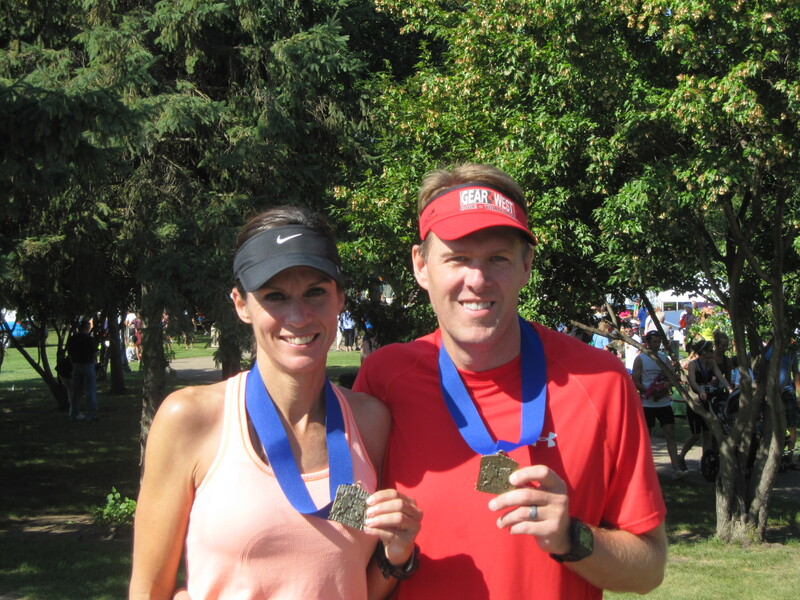 The half marathon was a confidence booster and it’s great to have something fun to break up the training. I’m doing another half marathon in September when my training plan has a 2 hour run on the schedule. Until then, I’ll be concentrating on getting ready for my half iron distance triathlon on September 9th which is only a little over 3 weeks away. The big race is getting closer!! I would love to run a half with my wife or/and my son. I hope that one day the dream comes true, no matter the finishing time. Glad you have found a day not so humid and hot and that you have met your goal. Congrats. Great smiles on both the pictures. Great race, Beth! I have always wanted to do this race, but I have always been a little afraid of potentially hot August weather. Last weekend was ideal, so that had to have been delightful! Much continued success with your training!